3rd Bn., 3rd Marine Rgt. FORWARD OPERATING BASE SALERNO, Afghanistan – Marine small unit leaders with 3rd Battalion, 3rd Marines recently polished their skills in effectively employing and “controlling” rotary-wing aircraft during joint close air support drills. As the Marines continue to hunt down insurgents and maintain security for Afghans in the rugged mountains along the Pakistan border, contact is often made at the small unit level. Closing with and destroying insurgents who habitually retreat as quickly as they attack is greatly enhanced by calling for fixed or rotary-wing air support. “This is probably some of the best training they’re going to receive outside of basic infantry skills,” said Air Force Master Sgt. 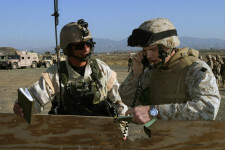 John Knipe, a joint terminal air controller who has been training America’s Battalion Marines and accompanying them on operations around Afghanistan. “In an infantry squad, you don’t have many ‘big guns’ available to you,” he continued. “If Marines need to pursue or break contact with an enemy, they may not always have the organic fire power to do that. “Being able to call for and effectively employ fixed and rotary-wing aircraft with the weapons systems they have can save that squad or platoon,” Knipe continued. With two AH-1 Cobra helicopters from Marine Light Attack Helicopter Squadron 773 screaming overhead, Marines from Headquarters and Service and Weapons Companies, 3/3 made radio contact with the pilots and then directed them to strike “enemy” targets downrange. Both companies are largely organized as provisional rifle companies and operate in the Khost area. “We’re having the Marines mark the targets, which the Cobras subsequently engage. We wanted to make this training as realistic for them as possible,” said Maj. Gerald Graham, America’s Battalion Air Officer. The Marines fired 40mm smoke grenades and M240G and M2 .50 caliber machine guns while the Cobras engaged and adjusted their fires as directed by the Marines acting as observers. Firing their 20mm cannons and 2.75 rockets, the Cobras made the range look like a very real battle space after just a few passes. The Marines each got 10-20 minutes of “station” time with the pilots, during which time they were coached by Knipe and Graham on everything from radio etiquette to how to adjust fire when multiple aircraft were available to engage a target. The pilots, stopping over at the range afterward to discuss the training with the Marines, were positive. “They did well,” said Maj. Dave Deep, a Cobra pilot with HMLA 773. “Even the ones who were nervous still called us in quickly and professionally. This will help us immensely in the field. “Having guys in a squad that won’t always have a forward air controller with them will help us all increase our effectiveness,” Deep continued. The valuable training should increase synergy between the air and ground units who operate together in America’s Battalion’s area of operations concluded Deep. 1st Lt. Whitney Foley, FOB Salerno, Afghanistan. March 2005. Cpl. Brian Moody, FOB Salerno, Afghanistan. March 2005.